Smoothes the appearance of the skin;Leaves skin more shiny and silky;Cleans dead cells. 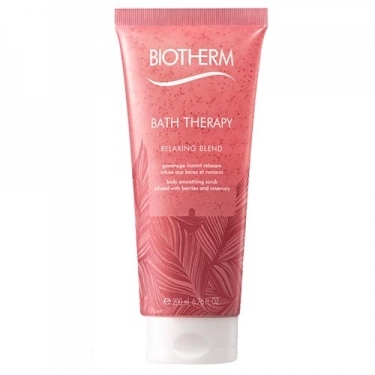 Bath Therapy Relaxing Body Scrub from Biotherm is a soothing cream that enhances skin renewal thanks to the combination of two 100% natural exfoliating grains: argan powder and perlite. Argan powder gently cleanses the skin of dead cells while perlite with a smaller grain softens the surface of the skin. Leaves skin more silky and shiny with a renewed look. The Ritual Relaxing Blend is ideal for relaxing in times of high stress. The infusion of relaxing berries and rosemary helps the mind to relax and leaves the skin soft and slightly fragrant. Gently massage the skin of the moistened body and rinse thoroughly.Apply once or twice a week. To prolong the shine use the cream Bath Therapy Relaxing Body Moisturiser.